CUE Cannabis is your one-stop-shop to discover, purchase & manage all your industry specific software. We offer analytics, accounting, marketing, POS & more. Get our Cannabis Business Software Whitepaper! It's the complete guide to everything you need to know about software for your cannabis business. 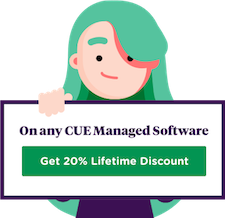 CUE is your one-stop-shop to discover, purchase and manage the bestaccountingsoftware and services for your cannabis business. Discover the best software solutions for your dispensary's business operations. Not all software solutions are suitable for every cannabis business. Try before you buy. Manage all your software solutions in one place with the CUE Cannabis Business Dashboard. CUE Cannabis is the cannabis industry’s first FREE online B2B marketplace providing dispensaries with a confident, safe and simple shopping experience. We serve as an industry-knowledge hub and supply a platform for business owners looking to prosper in the rapidly expanding cannabis market. We strive to develop an industry-leading multi-vendor marketplace that connects the right software to the right marijuana dispensaries across the entire cannabis space. We've spent the time to research and vet the software and service that we recommend. While other research sites were built for advertising, we built the CUE Cannabis Marketplace to benefit you! or call us anytime at 720-246-8852 (Mon-Fri 9-7 EST) and we'll help you get started. Or call us anytime at 720-246-8852 Mon-Fri 9-7 EST and we'll help you get started.